After having a subscription to Burda magazine for the last 10 years and buying random issues for 5 or so years before that I've decided not to renew my subscription. I've always had FOMO thinking that the minute I cancel my subscription that Burda will release the best ever issue - and admittedly the October issue is looking pretty smashing. But I've come to realise that with my extensive back issues that I already have a version of about 80% of the patterns in each issue anyway, and I can easily download any patterns that catch my eye. Plus I have a very long list of Burda patterns from past issues that I really want to make and will never get around to with a new issue arriving each month. But if I'm really honest the increasing lateness of each issue being delivered each month was annoying me terribly and contributed to the decision, which is very petty I know! Anyway, all of this is to say that after many years I'm giving up on my Burda of the month challenge. I started that challenge as a way to make me sew something from each new magazine, but these days my Burda mags are the first thing I reach for when I sew so I don't need that motivation anymore. I will keep on sewing Burda, but it will be from my past issues and I'm instead going to focus on those older ones that I haven't used as yet. 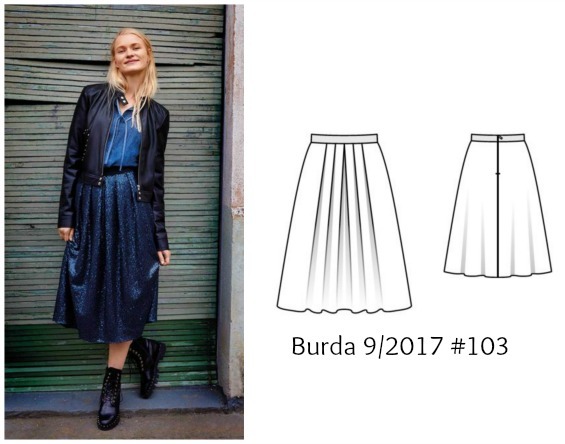 This is Burda 9/2017 #103, which is a pleated, mid length skirt with a narrow waistband. Burda's version is made from sequins, but I think it works equally well in a daytime fabric. I've made this from a mid weight linen picked up from Lincraft of all places. I remember 15 or so years ago when Lincraft used to have an extensive range of quality fabrics but these days their offerings are pretty sad. So when I found this linen at 50% off I bought not knowing how well it would wash and wear but I'm happy to report that it has held up really well with no fading or shrinkage. It doesn't have pockets though, and I know how some of you absolutely obsess over pockets! I can live without them though - they just add bulk to an already lumpy area of my body. But they would be pretty easy to add to the sides if you wanted to. I did reduce the length a bit because I don't have the height of a Burda glamazon and instead just made it slightly below my knew. I think this length makes my legs look a bit stumpy and probably breaks all sorts of fashion rules about not ending hem lines at your widest part but as I'm getting older I've decided I don't care about those things as much any more. Plus wearing this length means I only have to shave a quarter of my legs which is a great thing all year round. I replaced the singlet top with a turtle neck top and denim jacket and it was warm enough to wear on a mild winter Sydney day just recently. So to everyone else who is doing their own version of a Burda challenge, whether you've been doing it for years or newly started this year best of luck to you! 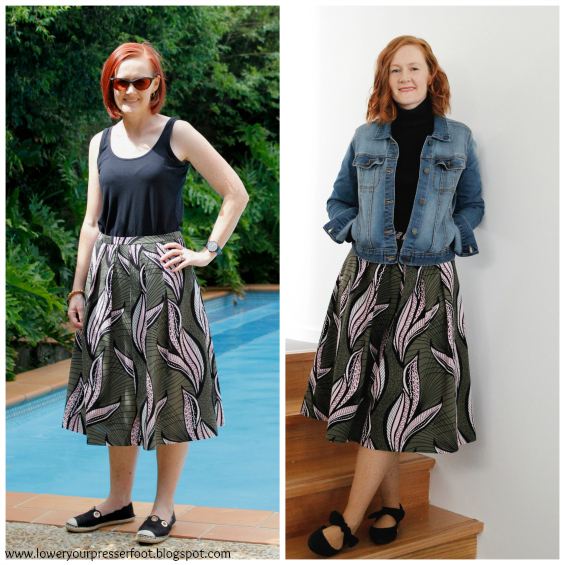 I've found that by doing this challenge I've made patterns that I wouldn't have normally considered and it did introduce some structure to my sewing so many good things came out of it. But it was starting to feel like a bit of chore that I had to get done each month before I could get onto making other things, so I'm looking forward to just making whatever catches my eye now.